Baby milk or infant formula is primarily used as a substitute for human milk. Other uses include “Follow-up” products as a dietary supplement for older infants and special formulations for specific nutritional needs or to overcome allergies e.g. soya-based milks for lactose intolerant infants. The finished product is either supplied as a spray dried powder which is reconstituted as required, or in liquid form packed in “ready to use” sterile feeding bottles. Typically added ingredients include Milk proteins, Lactose, Soya protein, Maltodextrin and various vitamins and minerals. The selection of raw materials, formulation, manufacturing and storage of baby milks is one of the most stringently regulated in the food industry. The base liquid which may be either milk or water is weighed/metered into the process vessel. The liquid may be heated to aid dissolving/hydration of powdered ingredients. Powdered ingredients - milk proteins, etc. are added to the liquid and mixed until dispersed. Some heat-sensitive ingredients (e.g. vitamins) may be added at a later stage. The premix is usually homogenised by passing through a high pressure homogeniser. The product is heat sterilised/pasteurised. The product is spray dried before packing. The powders are very cohesive and must be added at a controlled rate to reduce lump formation. Long processing times are required to complete dispersion and achieve a lump-free premix for homogenisation. The vigorous agitation required to disperse the powder can lead to foaming. The process must be carried out in the most hygienic manner as possible. Problems can arise with conventional systems as they tend to allow a build-up of partially hydrated powder on vessel walls and mixer shafts, etc. raising potential hygiene issues. Premixing the ingredients at raised temperatures increases the risk of bacterial contamination. A Silverson High Shear mixer can produce an agglomerate-free premix in a fraction of the time taken by conventional methods. The high concentration of solids made possible by high shear mixing can eliminate the evaporation stage. For the large volumes typical of most production facilities, the Silverson Flashblend is most suitable (see below). Other models may be used depending on certain factors. The base liquid is drawn from the vessel by the centrifugal pump and passed through the venturi assembly into the In-Line mixer. The high velocity flow through the venturi creates a vacuum in the chamber below the powder hopper. The liquid is returned to the vessel by the self-pumping In-Line mixer. The powder is fed into the specially designed hopper. Once the liquid is recirculating the powder feed valve is opened. 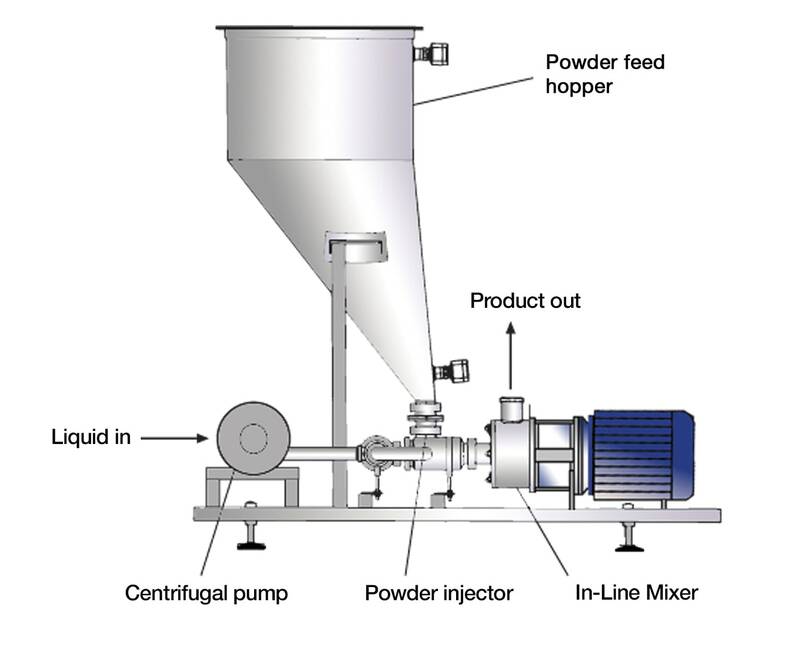 The powder is drawn into the venturi, where the liquid and powder streams are instantly mixed and pass immediately to the inlet of the high shear In-Line mixer. The liquid and solids are then subjected to intense high shear in the workhead of the In-Line mixer. When powder addition is complete the bypass valve is opened, switching the Flashblend to high speed recirculation mode. The entire contents of the vessel pass through the Flashblend in a short mixing cycle, accelerating the hydration process.